While it's pretty obvious what this is a painting of I'm going to wait until it's finished to post it all head on and explain what it is and what it's for. Suffice to say it's taking a lot of meticulous work to finish (scales and leaves, leaves and scales) which is just what I need right now. It's brilliantly curated and all of the work looked amazing! 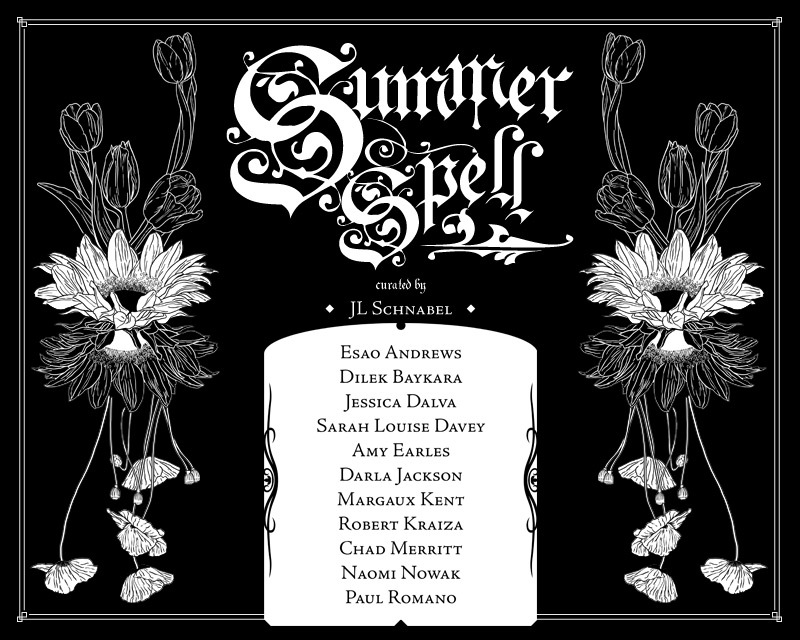 ALSO please do check out the beautiful print Amy Duncan made of her piece from the Empty Night Skies show. 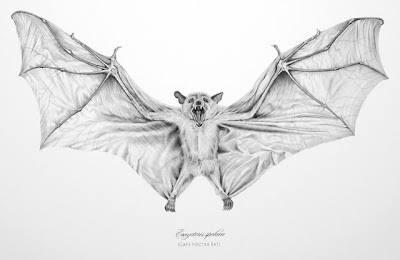 $20 of the total print price will be donated to Bat Conservation International! 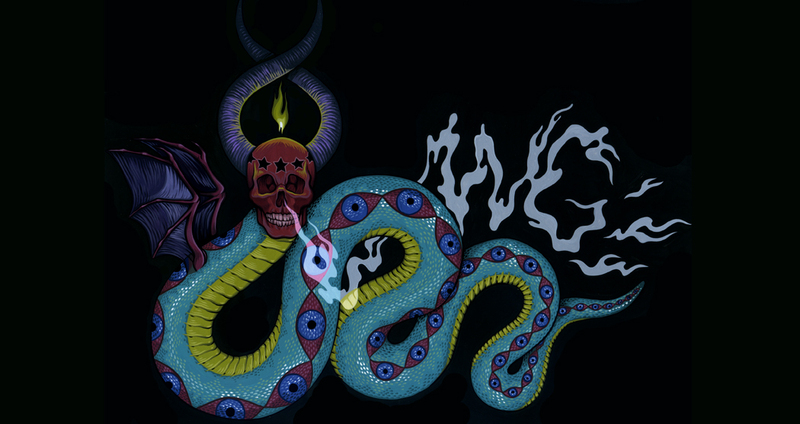 She and her husband make beautiful archival quality prints of her work (and eventually other people's work) under the name Lepus Luna and Amy herself is an amazing tattoo artist and all around neat lady! This one took a while to get through. It's a real brick of a book, and like most of the reading I've been doing lately it's an academic work heavy on notation and footnotes. I've been making more of an effort to refer back to those for useful information and tips on interesting further reading (especially when I find a friend with JSTOR access). I should start by saying it's VERY thorough, spans pretty much the whole of human history and contains probably more than a normal person would ever need to know about grimoires. It's academic but pretty accessible for someone without a lot of academic background like myself and at times is even somewhat light- hearted. 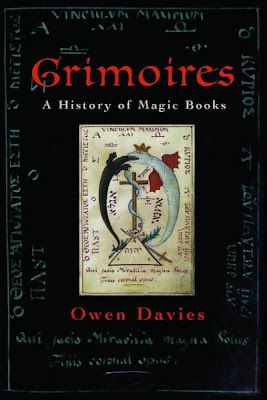 Some of the more interesting points for me came in the discussion of early grimoires and the birth of magical/scientific knowledge as ancient civilizations came in contact and started to translate each others work. It also serves as a history of the book, a discussion of the ways in which information is passed around, stripped of its original meaning, or introduced in a completely new context, sometimes fraudulently and it's interesting as you read the book to see the same texts or names or artificial magical pedigree popping up in renaissance Europe and then Iceland, then Lancaster PA and then Harlem in the 50's all with a claim of a mystical ancient Hebrew origin. I was particularly interested in the way the seat of mystical knowledge seemed to shift over time so claims of the (false) origins of the information in the books would shift from ancient Egypt, to Toledo Spain, to Germantown, PA (where my father grew up!). I also particularly liked the segments closer to the end about the ways that grimoire culture made it to even puritan America and the ways in which it synthesized with African-American culture and religion and was later a source of inspiration and reclamation of Egyptian magical roots. Generally speaking it's a testament to the ways in which organized religious orthodoxy fails to meet the concerns of the average person. While organized religion could offer nothing to the poor, sick, hopeless and enslaved beyond "pray for a better position in the next world and tithe generously" it's not hard to see the appeal in folk magic that gave people the promise of control of their situation and betterment, spells to find money, cure their sickness, and gain power. I have some further related reading lined up: Black Magic: Religion and the African American Conjuring Tradition and Galdrabok: An Icelandic Grimoire. 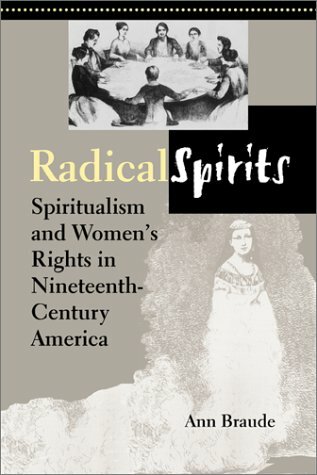 This book is basically an extremely thorough account of the Spiritualist movement's participation in radical reform in the U.S. A lot of the early chapters establish a precedent of radical religious movements in the U.S. from groups centered around living female messiahs, groups who went to the woods to be celibate and await an imminent apocalypse, Quakers, Shakers the Oneida community and finally Spiritualists. The early part of the book focuses on the ways in which the Spiritualist philosophy extended beyond a belief in spirit contact to a set of ideals for the living world; equality for men and women and all races, a world without hierarchy, where no person had power over another persons body or soul, the abolition of slavery and the liberation of women with a heavy concentration on marriage reform (and some times abolishment). Generally this message was reinforced by spirit messages and spirit lectures and automatic writing, proclamations from the spirit world delivered through a living medium calling for changes that would bring human civilization to a new level of enlightenment. As is discussed in the book below, the loophole of lack of agency on the part of women in delivering these spirit messages allowed for women speak publicly and radically and advocate for women's rights in a time when women speaking publicly were at best ignored and at worst condemned. One of the points made early on in the book is that by shying away from discussion of the spiritual movements engaged in women's rights historians are writing out the hard work and persistent advocacy of these women as well as the experiences of many African American women who at the same time were fighting for their right to preach in Christian churches. Unlike most dominant organized religions these new movements offered women the opportunity to be religious leaders and speakers with the same if not more potential for spiritual authority as men. 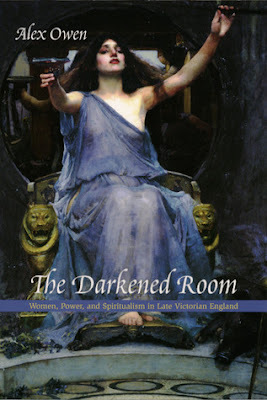 Towards the end the book discusses the decline of spiritualism, the familiar fracturing of its adherents, and the changes that came when women could begin to speak openly as themselves rather than as spirits. This book is long and absolutely packed with interesting information about radical religious movements, marriage reform and the right of women to decide when to have children, the right of women to speak publicly, the intersection of the abolition and suffrage movements and the ways in which they failed to address the intersectional concerns of African American women, mourning culture and the comforts of Spiritualism, etc. etc. I really feel like it was a lot to take in and even more to try to describe in full so I may be missing something really interesting. Further reading I have lined up: Strangers and Pilgrims: Female Preaching in America 1740-1845 and Religion and Sexuality: The Shakers, The Mormons and the Oneida Community. I actually read this book before Radical Spirits, just because I happened across it in a book store while waiting for the other one to come in the mail. It was written and researched around the same time but began as a study of women in Victorian England who were institutionalized by their husbands and family members with no rights or recourse. 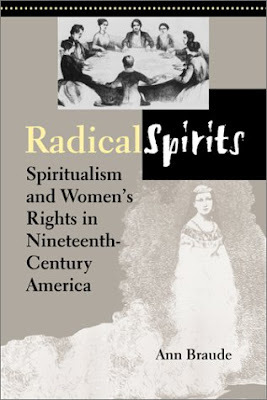 While researching the topic Owen found a common thread of female Spiritualists whose faith was used as evidence against them and ended up writing a book that is more of a critique of gender constructs within the Spiritualist movement and the practice of mediumship. She really clearly lays out the ways in which Spiritualism offered what seemed superficially to be a way to operate outside of the limiting construct of "female" gender in Victorian society but still conformed to all of the limitations and expectations established for women of the time. The success of women mediums relied on a belief in the innate receptiveness and passiveness of women, that "female" is a set gender with an conscripted set of virtues and qualities, that women could be inhabited by spirits because they were vessels and that they only spoke with authority because other voices spoke through them. While it resulted in seemingly subversive opportunities for these women who now had a platform to speak publicly about all kinds of radical reform it relied on strict gendered expectations rather than subverting them. There's an interesting chapter about the role of women healers who used unorthodox methods inspired by Spiritualism and Mesmerism that offered an alternative to invasive and uninformed orthodox medicine of the time. There's also a full chapter dedicated to the story of Louisa Lowe, who was institutionalized by her husband and after fighting for release successfully brought charges against him and her doctor and went on to join the "Lunacy Reform" movement and protect other women. The book also has a lot of interesting discussion on the seance experience itself, the ways in which women could act out through their manifestations and the movement to "test" mediums using invasive and somewhat oppressive means (along with a genuinely amusing account of the practice of "spirit grabbing"). Though it seems a little off topic one of the most interesting chapters was the one dedicated to the Theobald family. 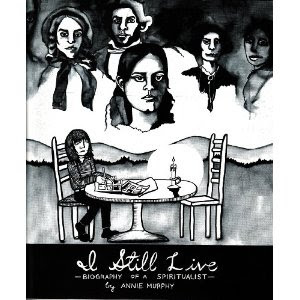 After losing several children the remaining members of the family discovered Spiritualism and as a group maintained years of communication with the lost children. After several family members discovered their talents as mediums they began speaking with the spirits daily, hearing stories of their lives and their growth in the next world and generally interacting with them as if they were living family members. I'm probably forgetting a lot of things about this book since it's been almost two months now since I read it, but it was interesting all the way through, with a thoughtful perspective on gender that I appreciated. Finally, I decided to break up all of my non-fiction reading with something fun that I started a while ago but never finished. Outside of reading tons of non-fiction I really enjoy short stories lately. I'm a fan of weird fiction that straddles the line between horror and science fiction with a grim world view. Generally one of my issues with fantasy writers in particular is the insistence on fantasy that is unrealistic and inventive enough to include magic and trolls and dragons but still inexplicably modeled precisely after a medieval European society mired in sexism, racism and tedious hierarchical monarchy under the guise of being "realistic" or "gritty". 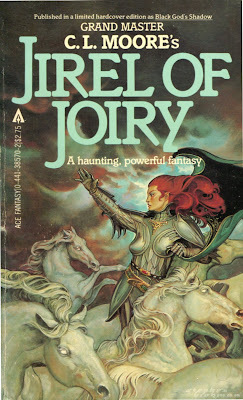 What I really appreciate about the Jirel of Joiry stories is that even though they are set in a real place and time in history (medieval France) Moore presents her without a noble pedigree or obligation, little attention is paid to the ways in which her occupation (soldier? sword wielding maniac?) is unlikely for a woman of her time (not that it's never happened), she is unquestionably successful at what she does, respected by her peers and leads a troop of considerably less brave men who follow her dutifully and somewhat fearfully. 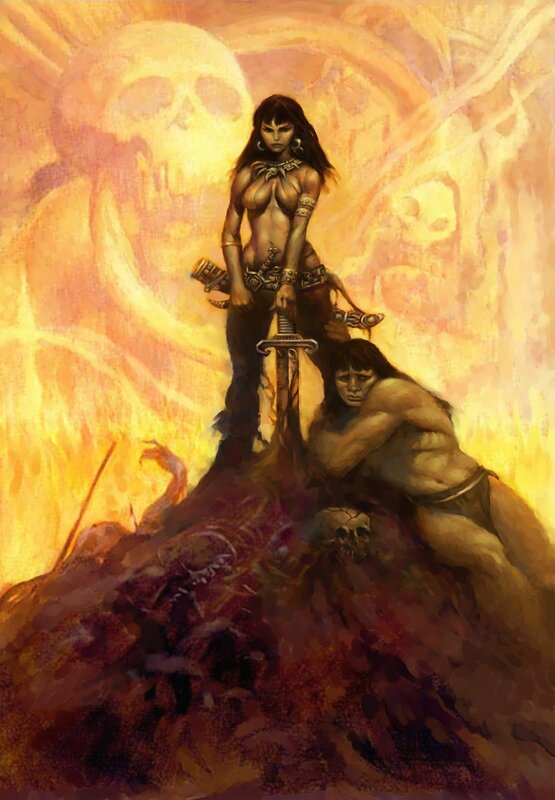 Like Conan she's beyond strong and brave, and completely fearless though hilariously her defining characteristic seems to be blind rage and an insatiable need for vengeance since that's what motivates her along all of her adventures. Like so much other weird fiction each story begins with whatever thin premise is necessary to place her in another dimension or unfamiliar place at which point the really amazing atmosphere and description begins. I would say this is definitely one of Moore's strengths and some of the alien, creepy and unearthly things she describes (particularly in Black God's Kiss and Black God's Shadow) are really creative and evocative. Some of the emotional development she was famously credited with I actually found sort of puzzling and occasionally problematic but it doesn't make her stories any less enjoyable. I also liked that while there was definitely a science fiction context to the settings because of the fact that each experience was filtered through the understanding of a Medieval person nothing was overtly understood or over-explained. What Jirel saw as a magical world might very well have been another dimension or even another planet and what she saw as monsters could very well be aliens. If you're a fan of the Howard/Lovecraft/Clark Ashton Smith school of weird fiction then you would definitely enjoy this. There are some really haunting little moments buried in these stories. I should note that the cover image I used for this blog post (which is an illustration of one of the spookiest moments in the collection) is leaps and bounds better than the metal bikini Red Sonja style cover my actual copy has so I would recommend seeking out one of the many cool older editions of her work. Tour of the Masonic Temple in Philly! The rooms are ridiculously over the top and the sheer disgust our tour guide had for everyone's stupid conspiracy theory questions alone was worth the price of admission. Their library also has a little museum full of odd stuff. Like this case filled with symbols carved from bone. Also a piece of George Washington's coffin?! We also stayed at the Yankee Pedlar on our way to visit my grandfather in Maine this year. You may recognize it as the famously haunted real life location from the new Ti West movie, The Inkeepers. It looks identical to how it did in the movie. As usual, we spent our time in Maine hiking, taking hundreds of pictures of mushrooms and weird bugs and haunting old roadside cemeteries. 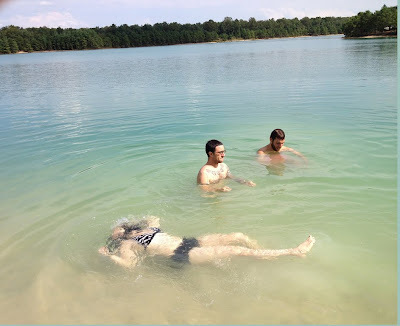 And last but not least the constant illegal lake swimming. This lake is supposedly haunted by the Jersey Devil, who pulls swimmers to their doom. I didn't know it could swim?! There were also so many fun shows. Infinite Void, Arctic Flowers, The Brood, Sickoids (including their last show) Kim Phuc, Night Birds, The Adults, Terrible Feelings, Smart Cops. Non stop super distracting fun. I was basically constantly either at work, on a bike, in a lake, in the woods or at a show. Or eating icecream.